Do you like to eat? Oh really? Me too! I know that I have mentioned food making a fantastic gift before, in the form of a CSA box or a Stock the Pantry Shower. This idea is similar and one that came from several different sources. Edward Antrobus is a big fan of groceries and food as a gift. I was reading an article over at Man vs. Debt and one of the commenters mentioned that one of her favourite gifts was a big selection of her favourite foods that her mother made. Now, that seems really quite reasonable and straightforward to do. I suspect many of you have heard that this is a very desirable gift for new babies, especially if it’s the second child! It is also a very common and appreciated gift for those who are sick or have just had surgery. Know someone who is off at college and needs a gift? Food wins hearts! For a great idea, that the writer has dubbed the “Taco Box” head over to The Kitchn! So – you’ve decided that good food is the way to go as a wedding gift, now you want to know how best to go about it? #1 – Check with your recipient about any allergies or dislikes! Next, you can ask them about their favourite foods. 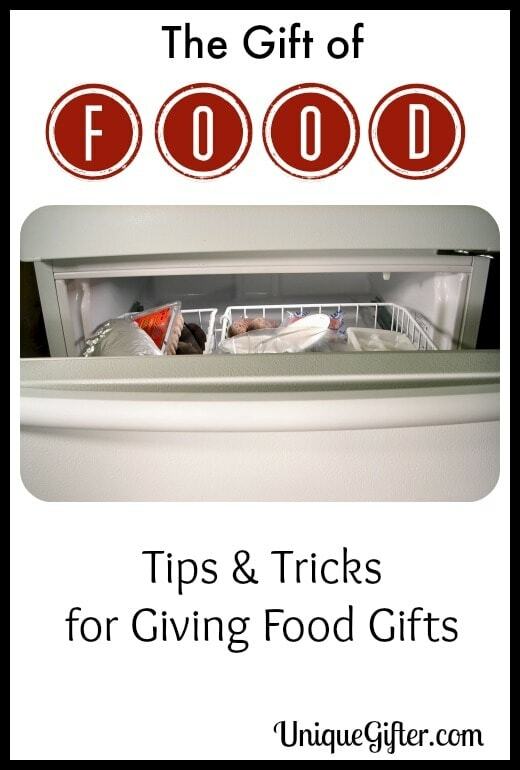 #2 – Figure out if you will be freezing, prepping fresh or providing all dry ingredients. This question raises two logistical concerns. Do they have sufficient freezer space? When will you deliver the food? #3 – Cook up a storm! There are a great many meals that would be great to receive as a gift. Ideally, you will provide dishes that can easily be frozen or ones that can be kept for many days without going bad. A fantastic option would be to follow the lead of Plunged in Debt, who did a months worth of freezer meals in one day with her sister! One of their best tips: Take the Big Cook Cookbook out from the library! If you are going to be making a bunch of food for someone else, I definitely recommend doing some for yourself at the same time. If you are after a selection of great Christmas gifts, consider trying your hand at canning. You can make delicious foods for very reasonable prices and a bit of effort. You don’t have a canner? Don’t worry! You can simply use a big pot and zip tie together a few jar rings, as long as the pot is deep enough to fully immerse your jars. To keep things affordable, try to pick up jars at thrift stores or garage sales. Occasionally they will go on sale at retailers as well. When someone gives you a gift in a canning jar, make sure to return it if at all possible, they are coveted! Once you have everything you need to can, start keeping an eye out for discounted fruits and vegetables at your grocery store or green grocer. Canning is the perfect use for those sad looking fruits, which you can pick up for a steal of a price. The best example of this I’ve seen? Mortgage Free in Three scored a heaping amount of fruit for a single pound! Food hampers are amazing presents! I've often given them to grandparents and in-laws and they always go down well! Yes, everyone seems to love them! Thanks for the link love. I love food as a gift! My sister and I are spending this weekend baking up a storm to distribute as gifts and I would gladly accept groceries for a gift-it's cash money back in my pocket! Yummy! I haven't done any baking yet this Christmas…. soon, I hope! Yes, groceries = money! I love getting food too, whether it is a homemade gift or a basket of gourmet treats. In Guatemala it is common to give your workers a plastic basket (reused to go to the market) with basic food like rice, beans and cookies. It is like an adorned cash gift since they would buy those items anyway. More elaborated baskets include a bottle of wine and finer foods, sometimes grapes and tropical fruits. It is nice since the supermarket has them all wrapped up at no extra cost. Giving food is a great idea, especially for an expecting parent. Many don't plan ahead. But the loss in time while taking care of baby often means people eat out a lot more during this time. However, if you have something homemade that you can pop in the microwave or heat in the oven for a few mins, it can save a bit of money and time. Ah, good point about the eating out more often as a result. There's also often poorer health choices made, for the convenience factor. Money, health, convenience and all! I love this idea! I mean, everyone needs olive oil, right? And you can do a cool gift basket with other really wonderful things — maybe things that are a little too fancy for the recipient's everyday life. Truffle salt? Aged parmesan? Anyone can feel free to send me truffle salt and aged parmesan. No olive oil though. Spouse bought more after not finding the giant tin of it in the cupboard… I think we're set for two years! I thought you were going to say you don't like olive oil, I was going to be FLABBERGASTED! Naw, just bacon. I also don't care for onions. Ya, no bacon. The "willingness to pay" argument only extends so far as people comprehend things that way, which as we know is not the case. In my experience, everyone in the above mentioned situations is extremely happy to be gifted food. Surely someone brought you food when you had your kid and you appreciated it? I've gotten food as a gift once and I loved it!